Like many of you, I knew the time would come to write my book and 2007 was the year. 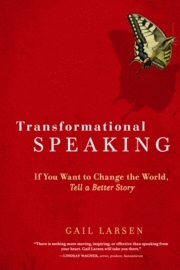 And now Transformational Speaking: If You Want to Change the World, Tell a Better Story has been published. Go to “The Book” on this website to view the covers, contents, and acclaim – and, of course, to order! The twelve principles below emerged from a teleclass I was asked to present for coaches who are part of a SIG (special interest group) for public speaking. 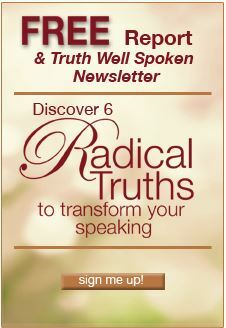 These fundamentals apply to all who aspire to attract clients through their speaking. 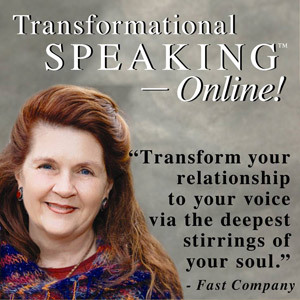 Great speakers are: vulnerable, passionate, authentic, energetic, courageous, enthusiastic, insightful, reflective, humorous, simple, sincere, charismatic, real, engaging, and informative – as described by coaches in the teleclass! When its time to describe your carefully crafted speech or workshop, are you suddenly at a loss for words? Writing a program description that stands out – and attracts the people who will benefit from your wisdom – is an essential marketing skill for speakers. Once you move into the world of paid/professional speaking, those who consider hiring you typically ask for a video demo to see you in action. A good demo tape will feature excerpts from several speeches to show your flexibility and range. For that reason, even while getting started with your speaking, consider investing in a professional video recording whenever you have a good-sized audience. When you have that shining moment when the heavens open and the angels descend, you definitely want to capture it on camera!